Professional photographer Sara Orme (foreground) works with some of the talent during a photo shoot at the Treaty grounds. You might have noticed a professional photographer around the Kura this week working with some of our ākonga. The Rangatahi Inc rōpū have been working with Northland Inc on developing a new suite of marketing photographs to be used for promoting Tai Tokerau to the international tourism market. Northland Inc approached the Kura about a month ago to see if we were interested in working with them on the project. The Rangatahi Inc ākonga have worked with Northland Inc on developing the creative brief for the photo shoot, and some even became models for the shoot. “We’re really rapt with the way this has worked out,” said Northland Inc’s Tourism Marketing and Content person Sarah Yeates. Maia Mokaraka, one of the Rangatahi Inc ākonga and models, said participating in the photo shoot had been an eye opener. “You don’t appreciate how hard the work is until you have to do it yourself. But I’ve enjoyed every minute of it,” said Maia. The photos will be loaded to the NorthlandNZ.com website once they are processed. The Māori military veterans’ claims before the Waitangi Tribunal will begin at Otiria Marae on Monday (21 March). 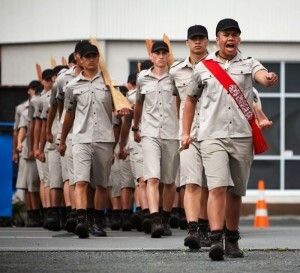 The Leadership Academy recruits have been asked to join the veterans for the hearing and will be helping out around the marae while the Tribunal sits. The veterans’ claims stem from the treatment they experienced during overseas wars and missions, particularly during the Second World War and the Vietnam War. There is over 40 claims before the Tribunal to consider. Some of the applications are detailed and harrowing accounts of the veteran’s treatment and exposure to chemicals such as Agent Orange which was introduced during the Vietnam War. The claims also covered the flow on effect to whānau and their communities which has lasted generations. A lawyer for one of the claimants said the Tribunal could provide Māori veterans with renewed hope that they and their whānau would be provided with ongoing medical care and support. Other issues relate to land settlement schemes as well as claims associated with rehabilitation. 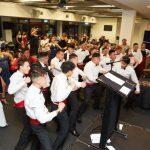 All the Academy boys need to be at the Kura by 6am on Monday (21 March). They will be leaving for Otiria Marae at 7am. Any queries to Staff Luke. Ph 021 438 429. Actor Regan Taylor brought SolOthello to the Kura on Wednesday. The play is one of a series of events being held throughout the country to celebrate 400 years of Shakespeare. Othello is one of Shakespeare’s most famous tragedies. The story of racism, love, jealousy, betrayal, revenge and repentance. The play is titled SolOthello because it’s performed by one person—Regan. 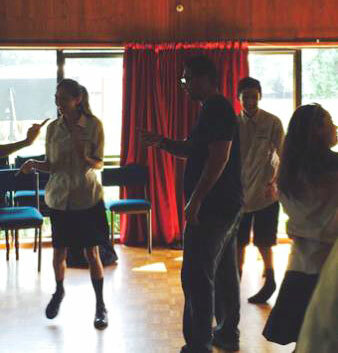 After the show on Wednesday, Regan held a series of workshops with ākonga. 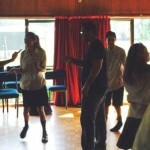 Regan is pictured working with a group of ākonga on performance. A large group of our Paerangi students will be performing at the Tai Tokerau Festival on Thursday 14th April at 2.30pm and our entire Kura whānau will be attending to support the kaupapa and enjoy being a part of the largest annual secondary school event. 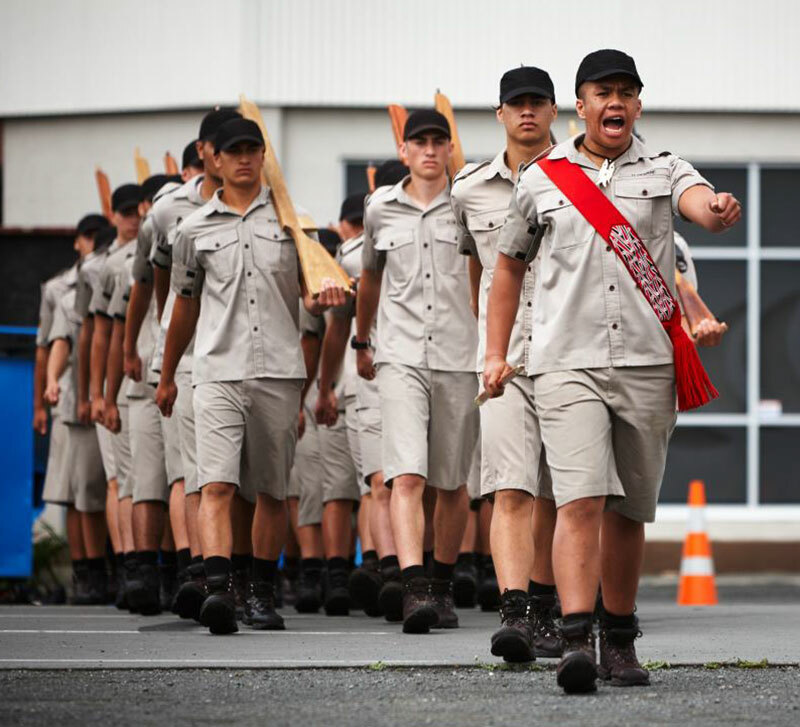 All ākonga will travel by bus, departing from our Lower Dent Street campus, at 9.30am and will return by 5.30pm. For ākonga who use the ‘North’ bus service, it will depart at the later me of 5.30pm that evening. Whānau are welcome to attend the event with us, but must make your own travel arrangements as buses will be full. Whaea Ana Henare (second from the right above) was welcomed to the Kura on Monday as part of the teaching staff. Whaea Ana came from Te Kura Kaupapa Māori o Te Rawhi Roa where she’s been for the past 14 years. 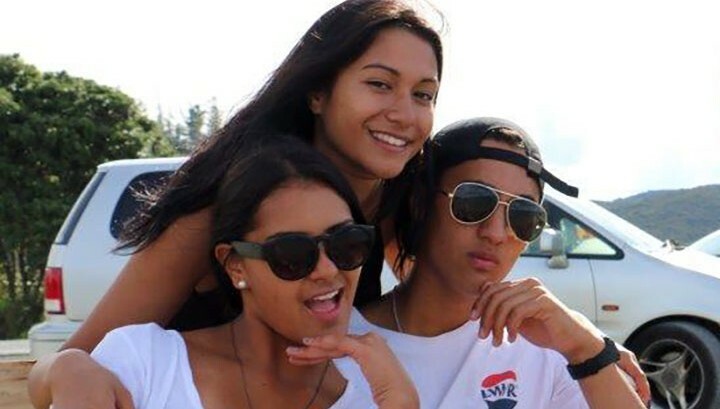 Defending a Northland Secondary Bowls title would be a challenge to most young sports people but not for TKW’s Kyneval Mokaraka who displayed a calm and confident exhibition of bowls on Friday (11/03) defending his regional title. Kyneval successfully won all three games he played with a total score of 55 points from 29 ends. Kamo Bowling Club is available for anyone who would like to learn or has an interest in bowls. TKW’s J19 girls team placed third at the Northland Secondary Schools Sprints at Kai Iwi Lakes last weekend. Papa Ralph said it was a good result considering their team practices have been disrupted and the 20-25 knot winds chopping up the lake. The Kura also had a J16 boys and a J16 girls teams at the event. The big man, Paora Allen, rumlbles it up for TKW (above). Nico Te Whata eyes a gap in the WBHS game (right), with Tahu Potiki Tawhiwhirangi in support. The score flattered Whangarei Boys’ High School in the end, but TKW’s league team never took a backward step in a torrid battle in wet conditions on Wednesday. And the big man, Paora Allen, led by example against an experienced and big WBHS team. The team has never lacked for effort playing in the southern section of the mid-week Adam Blair competition. But on Wednesday they came across a WBHS team in a menacing mood looking to secure top place in their section with the playoffs just around the corner. Newcomers to this level – Breton Gibbons, Rangatira Keerako and Te Rangi Munroe – gave valuable support on both attack and defence. Seasoned players like Qadmiel Edmonds, Tahu Potiki Tawhiwhirangi, Nico TeWhata and Diani Timms were competitive and outshone their more fancied opposition. Although the score line flattered WBHS, who scored four tries off of our TKW mistakes, the newcomers to the competition can take pride knowing they’ve made other schools take notice. Sadly this was the last game for the season, but a lot of positives have come out of this experience. TKW will lose a handful of players next year but were able to introduce some young and exciting talent for next year’s competition. We would like to thank all the boys that committed themselves to this venture and we look forward to 2017. The final score: 30 – 4. Whānau who have ākonga sitting NCEA this year will find a copy of the NCEA information booklet and exam timetable accompanying this pānui, and both documents were sent home with ākonga yesterday. 2016 NCEA Fees – $76.70 per candidate. Check if your whānau qualify for financial assistance.  14 September – All NCEA fees must be paid. This is to be paid directly to the Kura.  2 December – All NCEA fees paid ona er this date will incur a $50 late fee. If you have any queries about NCEA, please call Kaylem on (09) 438 4228. The Kura closes for the Easter break on Thursday, March 24. Kura resumes on Wednesday, March 30, at the usual time. Mauri ora e te whānau, tēnei a Tawera e tuku mihi atu ki a koutou i tēnei wiki tuaono. Kei te aro a Tawera ki te hanga Pake, hei te mutunga o te wahanga ko te manako ia kia oti matou i ētahi Pake. 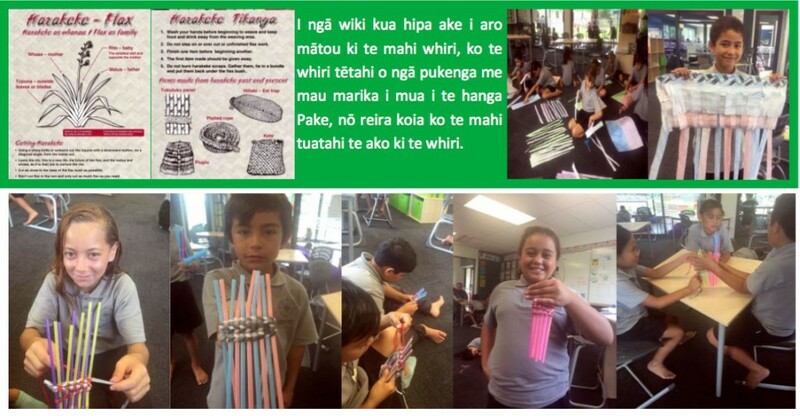 I ngā wiki kua hipa ake i aro mātou ki te mahi whiri, ko te whiri tētahi o ngā pukenga me mau marika i mua i te hanga Pake, nō reira koia ko te mahi tuatahi te ako ki te whiri. 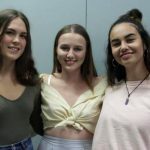 I tēnei wiki kei te aro a Tawera ki te mahi whatu, kei te whakamahi mātou i ngā pū ngote me te wuru hei whakaharatau. Sunday 9th April 2016 Waitangi Bay of Island. This year we have entered a small group of ākonga to participate in this event which is being held in Waitangi. We have 14 ākonga from Paenuku and four ākonga from Paetawhi who have registered. This is an amazing opportunity for this group, as for many this is the first time that they have given this sport a go. We would like to say a huge thank you to Whaea Tania and Matua Dan, for giving their time to coach our ākonga. Just a reminder for those who have not yet made payment, these fees are now due at a cost of $15.00 per child. Please see Whaea Lara in the Tari. We have four teams entered in the Whangarei Netball Association’s Saturday netball competition. We would like to thank our wonderful ladies for putting their names forward to coach our teams. Coaching is not an easy job, so we hope that whānau support them in any way that they can. Thank you also to Whaea Jackie for organising the making of our team uniforms, and Whaea Dallas for organising our team bags, balls and first aid kits. 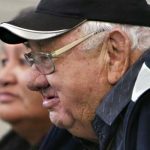 Payments should be made to Whaea Lara in the Tari as soon as possible. Eftpos will be available in the next week. Whaea Gloria has been coming in weekly to see ākonga and is a familiar face to ākonga. If you are wanting your tamaiti to see her, please come to the tari and complete a referral form. If there is anything that Whaea Gloria is not able to do, she will contact you by phone to let you know. She is able to prescribe ointments and antibiotics if required, however, will not do so without parental permission. The Kura closes for the Easter break on Thursday, March 24. Kura resumes on Wednesday , March 30, at the usual time. Ngā mihi maioha nā te Whānau Paenuku.